Our organization is recognized in the industry for offering the best quality Market Research Service. ASR research and consulting provides all kind of research and consulting services. We have a team of experts who keep updating our clients with all the investment pitches they have to make and then make a sensible bet. LBC supports market information analysis which is directly or indirectly related to shipping sector. In addition detailed tailored studies and advisory are carried out on request as per principle’s requirements. Based on our own experience of successfully moving into india in 2000, it's full of tips and advice from some of the best international marketing experts we know. Navigant has a dedicated and highly qualified team to systematically collect and analyze data and information about target customers to enable our Clients take informed decisions. We work on applications such as VOXCO, Confirmit and other world renowned applications to ensure accurate data tracking. 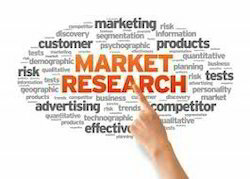 Market research is an vital implement for developing practical procedures and plan, assisting management to take calculated decision and identifies opportunities available in market. SSDI has been working closely with various Sharp subsidiaries to understand market requirements and Technology Investigations that helps our customers envision new products and services. From time to time we offer such research in various new business development areas like Energy, Healthcare, Education etc. We offer financial documention and market research services to the credit market. We also help in identifying the right equity partners and making presentations for PE funds and such.